Bimbola sent me her new single, Olori Aiye, earlier this month, and of course, I had to share it with you guys. I had actually come across her profile years ago on ReverbNation, and I particularly remember her soprano voice. "Life is a gift and music is an expression of the gift of life," says Abimbola Adebiyi. 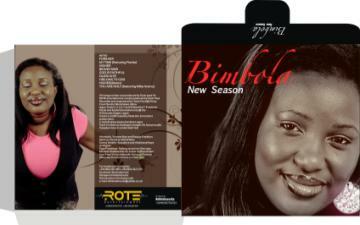 Bimbola is a native of Ekiti state and graduate of Olabisi Onabanjo University and studied Mass communication. Bimbola's music, tables the newest breed of sound evolution. Her songs are created to electrify your body, enlighten your mind and refresh your spirit, and her radio-friendly soprano is a true representation of the African voice. Bimbola is an artist of excellence and experience which has been acquired over the years having worked with the likes of Mike Aremu, Onyeka Owenu, Tosin Martins, Kunle Ayo, Judith Sephuma and performed at various platforms around the world. Her last album titled New Season released in 2011, is a fine blend of hip-hop,soul,jazz,dance hall mixed with a fussion of afrocentric rhythm. She is currently recording a multiple platform project due to be released before the end of the year. Her focus is to create a soothing sensation and a relaxed ambience of love, hope and truth.